Winter has hit us here in Lawrence, Kansas. After three days of sleet, the ground is covered with little ice pellets. Though the snow has not yet materialized, we are very lucky. My in-laws in Springfield, Missouri have been without power since Friday night and it looks like it will be the middle of the week until they get power back. In fact about 70,000 people are without power in Springfield. Luckily, they have been able to find a hotel room and are at least warm. St. Louis has also been hit with freezing rain, and over 100,000 people there are without power. I am sure that our friends that live there don't have power. If so, this will be the THIRD time this year they have been without power for an extended period of time. So I hope they are safe. My parents in Tulsa have also been iced in, as is my grandmother in Miami, OK. It is strange, this is the second time this winter that family to the south of us has has worse winter weather than we have. Throughout this wintry day, I have been knitting a lot. I love when I reach the point of a lace pattern when I can read the knitting, so that the stitches I encounter on the needles tell me what I need to do next. 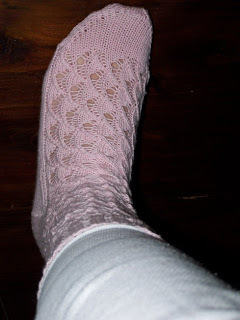 I have reached that point on my shell socks from Nancy Bush's Knitting Vintage Socks. This is my entry for the KAL's January Challenge. Not the best picture, but you can really see the lace pattern. I also made progress on the Blue-ribbon Wrap. I while I did not work on my vest this weekend, I did work on two new projects. A hat for the Dulaan Project made of "leftovers" And a scarf based of off a pattern from the book. Knitting Victorian Lace Today by Jane Sowerby. I am using Rowan Summer Tweed, which is a silk/cotton blend. Since the yarn is thicker than that called for in the book, I am knitting it on larger needles (size 11) and with fewer repeats than the book calls for. 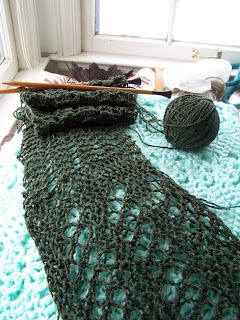 I am pleased with how it is coming out and how fast the knitting is going. Your shell socks are beautiful - I am just rounding the heel on mine. 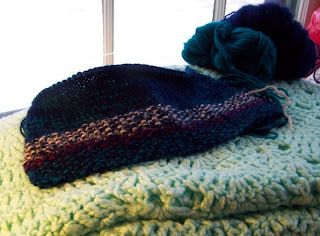 You other WIPs are intriguing ... the blue ribbon wrap and lace scarf are so pretty and the Dulaan hat looks wonderful with the seed stitch colorful border.